Just north of Shanghai’s oldest neighborhood lies its newest modern quarter, Xintiandi. This nightlife and fashion district, which is nestled inside a series of restored tenement stone houses known as shikumen, is a hotspot of entertainment, shopping and nightlife that really lives up to it’s name, which means “new heaven and earth”. 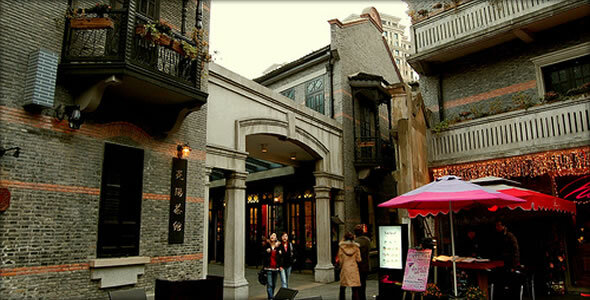 Unlike some of Shanghai’s other urban districts, Xintiandi is compact and navigable. Narrow cobbled laneways meander among shined-up grey stone buildings that nod to the city’s ancient past, while the local businesses, which include international coffee shops, upscale bars and restaurants and ritzy boutiques, remind visitors that this is, indeed, the Shanghai of the future. It’s entirely possible to spend the whole day in Xintiandi, though don’t expect to spend on the cheap – shopping and dining here gives the prices in London and New York a run for their money (literally). Ironically, the shikumen in Xindiandi that were once meeting houses for Mao Zedong and the founding leaders of China’s Communist Party have now become a beacon of capitalist prosperity, attracting international visitors with upscale commerce. If you’re looking for more places to explore check out this great guide on Backpacking China. Xintiandi is a truly charming place to stroll and, while it would be entirely possible to waste a day here (especially if you’ve got burning pockets), I like to start out by casually browsing the boutiques, many of which mix traditional Chinese designs with modern motifs to form a totally cutting edge, uniquely Shanghai style. The most famous of these is the venerable Shanghai Tang, one of China’s first luxury brand. 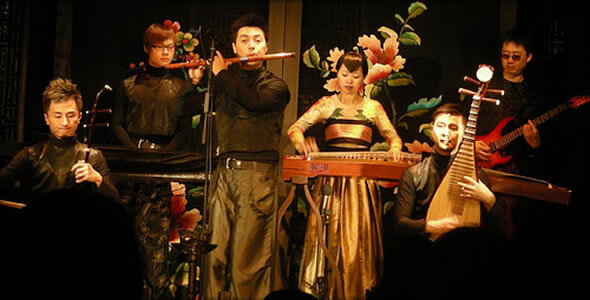 Shanghai Tang’s clothing is a modern nod to ancient Chinese fashion, consisting mostly of tailored silk patterns and new takes on old Chinese clothing styles. Just around the corner in the South Block, PH 7 is a local jewelry shop that specializes in unique bracelets, necklaces and earrings. The pieces are delicate silver decorated with traditional patterns. Chinese fashion designer Coco Ma is also cashing in on the avant-garde trends with Elements, an eco-friendly ladies clothing shop that carries women’s wear made from all-natural fabrics. As a pedestrian-only walkway, Xintiandi is one of the few places in Shanghai that boasts no cars and, subsequently, a refreshing lack of exhaust fumes. Split into two, the North Block houses mostly traditional buildings, while in the South Block, the shikumen architecture is less obvious and has made way for a large shopping center. Inside, visitors can find gobs of Western delights, from the uber-British fashion giant United Colors of Benetton to Europe’s French Connection and Giordano, among many others. 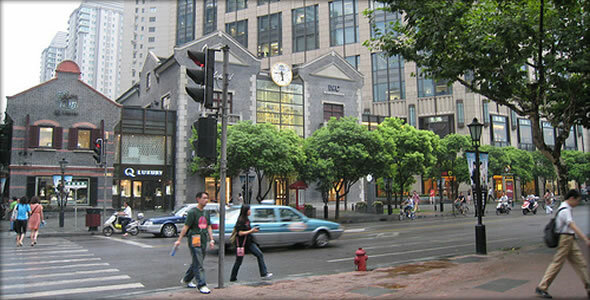 Though not light on your wallet, it’s hard to find anyplace more fashion friendly and chic in Shanghai. And that’s saying something. Xintiandi isn’t a difficult place to grab a bite. It is chock-a-block full of gourmet restaurants, bistros and eateries, everything from fancy fusion to traditional Chinese or straight-up Western food. Many of the restaurants offer outdoor seating, especially along the North Block, where the shikumen gates and tiled roofs create the ambiance of years gone by, and it is the ultimate place to people-watch, with a constant stream of Western tourists, rich Chinese, local gawkers and night crawlers passing through. Everyone is in a good mood in Xintiandi, simply enjoying Shanghai’s mix of old and new. On my most recent meander through the district, my boyfriend and I, weary from a long day of Shanghai walking, plonked down onto one of the large wooden outdoor tables at Paulaner Bräuhaus for some reviving steins of fresh German lager. Paulaner Bräuhaus is actually a Chinese subsidy of the German Paulaner brand, and the Shanghai flagship restaurant is a not-too-kitschy Bavarian themed beer hall and microbrewery – a rare thing in China. If you aren’t into brats and beer, Xintiandi has just about every type of tasty cuisine you can imagine. Munchies offers straight up American dishes like Cincinnati chili served by staff wearing tie dye, while Aniseed serves some of the best Vietnamese ph? in town. Several restaurants in Xintiandi are on the front lines of fusion, such as TMSK, which calls itself “new wave Shanghaiese cuisine”, with interesting combinations of French, Chinese and Italian cuisines, and new takes on old dishes. How very Shanghai. If you’re not hungry or don’t feel like shopping, there are plenty of other nooks and crannies in Xintiandi to check out, including several art galleries, a good few cafes and the UME International Cineplex in the South Block. Try the creamy chai at the Japanese-inspired Afternoon Tea, get a free haircut from the student stylists at the Vidal Sasoon salon in the North Block or discover what life was like in 1920’s Shanghai at Wulixiang Shikumen Museum on Taikang Lu. You should also take an hour to deepen your understanding of Xintiandi’s history by visiting the Site of the 1st National Congress of the CCP, a museum that traces the who, what and when of China’s Communist Party roots. Xintiandi couldn’t be easier to reach, and I’m sure the American architect who designed the district (Benjamin Wood) planned it that way. Just take the Metro Red Line 1 to South Huangpi Road Station and walk due south for about two block until Xintiandi’s charming atmosphere and quaint brick alleys unfold before you!